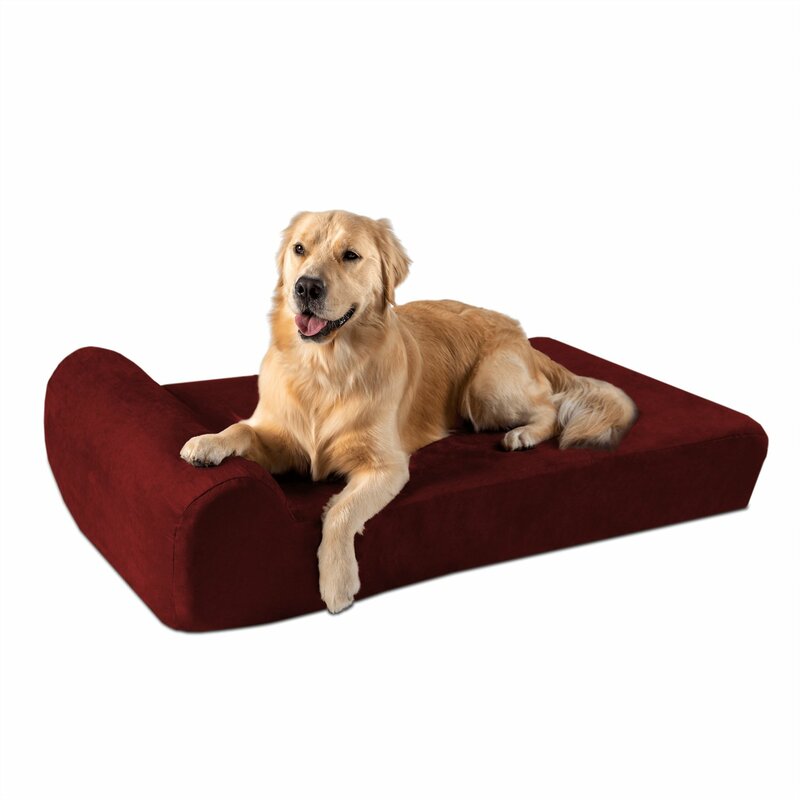 Pamper your favorite four-legged friend with the Big Barker Headrest Edition Pillow Top Orthopedic Dog Bed. This cozy bed is designed specifically for arthritic older dogs, big dogs at risk for developing joint issues and dogs recovering from operations. It may help to prevent and soothe joint pain by providing the comfort they need. Master furniture makers handcraft these luxurious pet beds using the highest quality American orthopedic foam. Designed specifically for arthritic older dogs, large breeds at risk for developing joint issues, and dogs recovering from operations. Helps prevent, ease and even eliminate joint pain and is specially calibrated for bigger dogs. 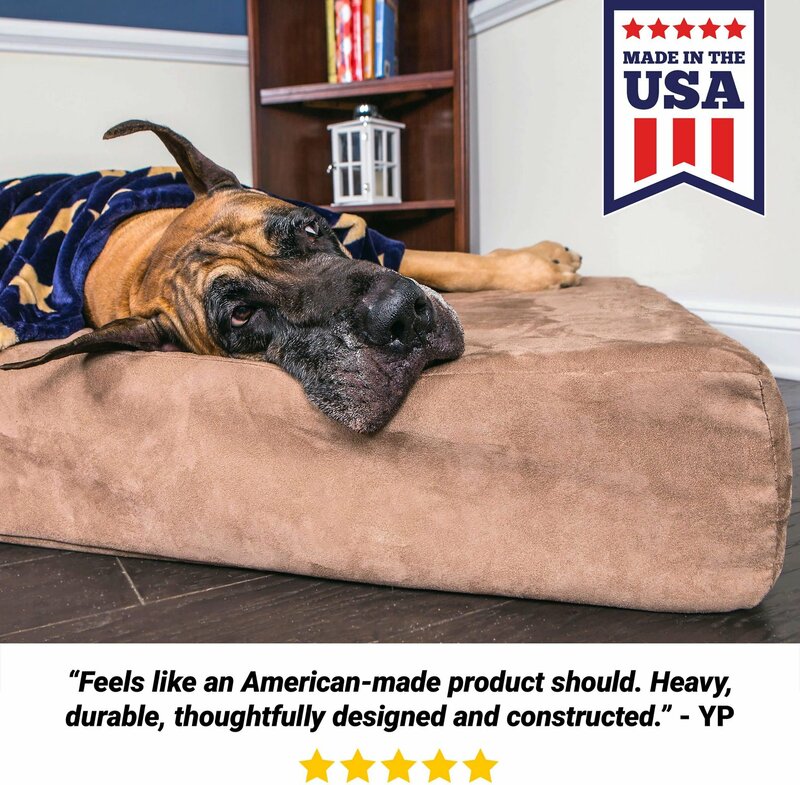 Comfortable and durable: handmade in the USA with premium quality orthopedic foam that is made to last, will retain 90% of original shape and won't flatten or pancake over time. Super-soft 100% microfiber cover for a warm, cozy bed that provides optimum comfort. Easy to clean: machine washable. Cleaning the Dog Bed Cover: Our dog bed covers are machine washable. Wash on cold, tumble dry. Our microfiber also does not shrink. As long as you wash on cold & tumble dry, they can be washed 1,000 times and they won’t shrink by more than fractions of a millimeter. Cleaning the Foam: The foam can be cleaned, but it’s a bit more hassle than washing the cover. If there’s ever an accident or a spill on the foam, what you want to do is soak the affected area thoroughly with warm water and dish soap. Let it sit for 5-10 minutes. Then press out as much moisture as you can. Do not “wring out” the foam, because wet foam is very heavy and tears very easily. Leave it in a dry place. It might take a couple days to completely dry out, but when it does, it should be good as new. The microfiber covers are water-resistant, but not 100% waterproof. Things like drool, licking or a wet dog coming in from the rain will NOT get through the fabric. Microfiber is a very tightly woven fabric, so the "holes" are very very tiny. Drool, wet fur, etc will be blocked by the microfiber cover. However - if you spilled a glass of water on the cover and let it sit for a long time, it WILL get through. What if my dog won't use the bed? While most dogs love the bed right away, it's not uncommon for some dogs to take up to a few weeks before getting used to a new bed. Don't worry, almost all dogs fall in love with the bed, it just takes some dogs longer than others. Rub your hands all over the cover. It often helps to get your own scent on the bed. Lay on the bed yourself. This might get your dog interested in approaching and possibly stepping onto the bed. If your dog's old bed has a removable cover, take it off and lay it on top of the new bed. This can sometimes make the new bed seem more familiar. Put the bed in the exact spot where he lays while you're home. In my house, it's often right next to the couch. It doesn't need to stay in this spot, but it can often jump start the "trying out the new bed" process. Old fashion bribery. Get your dog to lay down on it, then bribe with a treat. Bribe every few minutes it stays on without getting up. Most importantly though, just give it time. Are the beds chew proof? No, the cover is not made from chew resistant material. We use a furniture grade microfiber. It's "tear resistant" - meaning, it holds up better against nesting/digging than most types of dog bed covers. But dogs can chew through it if they're determined. How do I clean my Big Barker products? Our dog bed covers are machine washable. Wash on cold, tumble dry. Our microfiber also does not shrink. As long as you wash on cold & tumble dry, they can be washed 1,000 times and they won’t shrink by more than fractions of a millimeter. They’re also very easy to take on and off. Most dog beds just zip on a single side, but we use zipper around 3 sides. The crate pad covers are also machine washable, however it’s easier to clean them with just a wet rag. Since they’re made with waterproof backing, don’t worry about getting the foam wet. If soiled, you can wipe with warm soapy water. Any dish soap will do. If you do choose to machine wash, use low heat. Dry on low for 10-15 minutes. IMPORTANT: Never use high heat settings in the washer or dryer, high heat will destroy the waterproof backing. Machine washable. Wash on low heat, dry on low for no more than 10-15 minutes. Drying the liner on high temperature settings will destroy the waterproof backing. The foam can be cleaned, but it’s a bit more hassle than washing the cover. If there’s ever an accident or a spill on the foam, what you want to do is soak the affected area thoroughly with warm water and dish soap. Let it sit for 5-10 minutes. Then press out as much moisture as you can. Do not “wring out” the foam, because wet foam is very heavy and tears very easily. Leave it in a dry place. It might take a couple days to completely dry out, but when it does, it should be good as new. 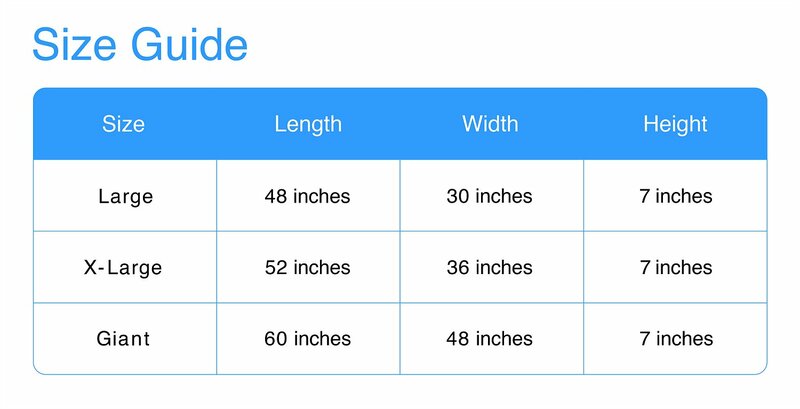 How do I know what size is best for my dog? The most important measurement is the width of the bed. What you want to do is have your dog stand up straight, and measure from the bottom of the paw to the top of the hip or shoulder. This is the amount of room that your dog needs to be in a full 100% stretch position. Compare that measurement to the width of our sizes. You'll want an extra 3-4 inches. For example, if your dog measures 25 inches, you'll do great with the Large, which is 30" wide. But if your dog is 28 inches, you'll want to bump up to the 36-inch wide XL. Note: the foam composition is the same between the Large, XL, and Giant sizes. All 3 sizes can easily support a 300 lb dog if they have to. Dog bed that I am jealous of! This bed is perfect for our Great Dane (and me when I get in trouble). I wish I knew about this company when I had my German Shepherd, I’d probably still have the bed as they are amazingly durable. Don’t let the price scare you, the value is amazing. Ordered the Big Barker, Large, Chocolate with headrest (60 lb dog). It arrived and there was an issue. Contacted Big Barker directly and they *immediately* fixed the issue. So far our dog seems to like the bed, seems to be of great quality and I am 100% happy with the fantastic customer service I received from Big Barker! Can you put a price on comfort and solace for a loved one? It’s a heavy duty bed . I have 3 German Shepherds and it’s a great bed but very hard to get the hair off of it !! I tried vacuuming it and nope! Humans wish they had it this good! We have had ours for 2 weeks. It's so comfortable that my teenager curls up on it with our German Shepard for some bonding time. We love it. This bed is nice and sturdy. However, there are some cons about it. First, the head rest is smaller than shown on the picture. Also, for how pricey it is, I'm surprised at how easily it stains. I bought the chocolate colored bed yet I clearly see stains from regular plain rawhide (not basted), treats, and even wet patches from dog drool. Washing doesn't take all of the stains away completely. My big dog of 140 pounds loves his new bed. (He still visits his couch though.) The Big Barher is large enough to support him and his legs, he can really stretch out. His arthritis won't be making him complain as much with all this comfort!